Curved handle design reduces bending-over, making the Dock Pro dock cart easier to handle than conventional carts, while the unique angled tub feature provides better leg clearance for maneuvering. 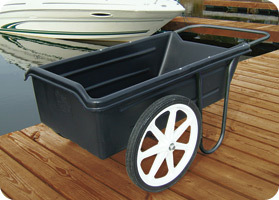 The Dock Pro dock cart is simply the easiest way to carry all your gear from the car to the boat. Features a spacious 7 cu. ft. heavy wall roto-molded poly-tub that will not rust or rot. Zinc coated corrosion resistant hardware used throughout. Plastic rim wheels with roller bearings will stand up to the harshest marine environment.